One of, if not the earliest example of the Role Playing Game genre on a computer system is dnd, derived from the more expansive Dungeons and Dragons line of pen and paper RPGs of the time. Written in a programming language called TUTOR for the PLATO system, which was used almost exclusively at the university of Southern Illinios, by Gary Whisenhunt and Ray Wood. It is in fact the third known dungeon crawl game designed using PLATO, with predecessors ‘pedit5’ and ‘m199h’ deleted shortly after their creation because they were created without the knowledge of the governing body who owned the system and used space reserved for lessons. Unlike today, memory and space allocation was extremely cramped and strict monitoring of its usage was in place. This makes dnd the first game specifically created with space officially allocated for its development and storage. This title was firmly based in a fantasy setting and introduced the concept of special, more challenging encounters that capped adventures and would later be referred to as ‘bosses’. Players created and named a character (based on four base statistics) and then ventured into a multi-floored area known as ‘Whisenwood Dungeon’ in search for both a Grail and an Orb. As players complete levels (displayed from an overhead perspective with stats and inventory listed either side of the screen) they were given the option to progress to another layer of the dungeon, but they were also free to revisit previous levels or to leave the dungeon altogether, allowing for non-linear play. Leaving a dungeon allowed a player to regenerate health and regain spells that had been cast before returning. Alterations were made to the basic game regularly, with fellow students Dirk and Flint Pellett making substantial additional content. 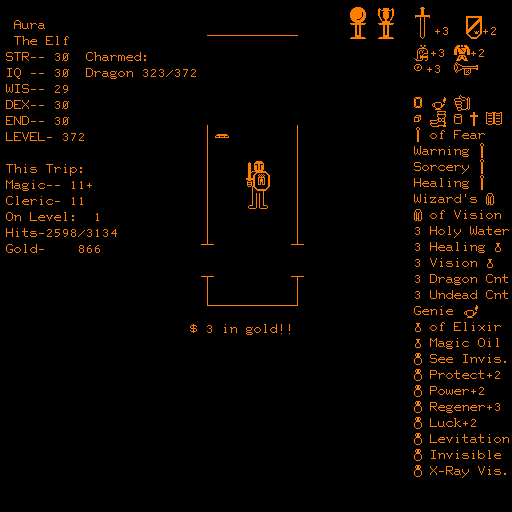 More dungeons, known as the Cavern and the Tomb with a slew of different creatures and treasures appeared, as did graphical icons on the games User Interface (UI). The game proved massively popular on PLATO and can be played to this day on NovaNET and Cyber1 systems. Dirk Pellett in particular has been very active, restoring the game from tape and bringing it to current TUTOR language standards. Interestingly this title features a level of graphical prowess that won’t be seen on DOS systems for quite some time, and manages to generate a significantly large dungeon to explore. Factors such as evading an attack taking in to account the space the player inhabits and his encumbrance level are ahead of their time. Unlike the later DND (not to be confused with dnd), the game pays obvious homage to Dungeons and Dragons without feeling like an extreme case of plagiarism, and would go on to inspire later PLATO games such as Avatar and Sorcery and Moria. Icons were soon added to the User Interface (UI). The name Richard Garriott is sure to be remembered as one of the most influential in RPG history. Sometimes known as Lord British after his on-screen counterpart in the Ultima series, he’s a man who has shaped the flow of the video game RPG considerably. Alkabeth was his first foray into the world of RPGs and presents us with a dungeon crawl not a million miles apart from dnd. A labour of love, a teenaged Garriott was one of the first wave of coders using Applesoft BASIC and worked on the game in his spare time from home. Originally titled D&D and based on the Dungeons and Dragons source material, he play tested it regularly with fellow pen and paper players but didn’t believe that the public would enjoy his work. When the game released version 28b he demoed it for the manager at the Clear Lake City area CumputerLand, where Garriott worked and who suggested he try selling copies through their store. Electing to sell the game for 20 dollars in a plastic ziploc wallet with a photocopied instruction manual and a hand drawn cover produced by his mother, a copy found its way to the California Pacific Computer Company who quickly contacted Garriott and arranged a meeting that saw him receive 5 dollars of every copy sold across a much wider area. The title Alkabeth comes from the works of J.R.R. Tolkien, in specific a passage from the Silmarillion, although the game does not borrow heavily from that setting, instead being closer to Dungeons and Dragons in tone. In early versions of the game the final boss was named the ‘Balrog’ after the encounter in the mines of Moria in the Fellowship of the Ring, which would be later changed in Ultima titles and re-releases to Balron for copyright reasons. Gameplay saw you as the player wondering a simulated first-person dungeon rendered in wire-frame white lines on a black background. Unusually the game starts by asking you to pick a lucky number which is used to set which of the randomly generated worlds will be selected, then asks for a difficulty level between 1 and 10. Once you’ve created your overworld the game will roll your stats and allow you to choose between a Warrior or Mage class. The Warrior able to use a bow for long range attacks and wield a deadly Rapier whilst the Mage can use a number of extremely useful spells. Players are then presented with the opportunity to outfit their adventurer in a shop before starting their adventure. Whilst combat and damage are always a factor the main way players will die the first few times will be due to lack of food, which needs to be stock piled and eaten throughout the game. Each death will see you re-rolling a new character, as the game features no form of save system. Whilst Alkabeth has no defining ending, continuing until you finally die, the overall goal is to become a knight in the service of Lord British. Somewhere on the overworld lies Castle British and this must be located to get the games narrative rolling, giving players their first obstacle to overcome. These segments are displayed on an overhead map rather than from the first person viewpoint used in dungeons, and Lord British will inform you of your quest from there. There are no encounters outside of dungeons, and curiously no way to heal lost Health Points (HP) aside from leaving a dungeon and being restored based on how many monsters you’ve slain. The first person viewpoint was impressively implemented. While not officially stated, Alkabeth is seen as the prelude instalment of the Ultima series that would soon follow. The title was even included in the Ultima Collection which saw release in 1998, and was retitled to Ultima 0. The version in this collection ran through DOS, making it the first official port of the game to any system other than the Apple II, although an unofficial fan-made PC version had been made available online in 1995. Later the game would be recreated on the iPhone for digital purchase through the iStore as an app. This edition featured a simulated Apple computer screen and keyboard and had the option to streamline the input controls to dedicated on-screen buttons rather than have the full board at all times. Many people will have experienced a ‘Roguelike’ in the past and of late elements of this sub-genre have become increasingly popular in modern gaming. Rogue is of course the granddaddy of them all, and has seen countless remakes on different systems through the ages. First developed by Michael Toy and Glenn Wichman in 1980, the key element that drew the attention of the masses (in particular those using Unix systems in colleges) was procedurally generated content. This essentially meant that no two games would ever be similar, even if played by the same player with the same parameters. Unlike Alkabeth’s wide selection of worlds to seed from, this gave truly infinite re-playability. In Rogue the player assumes the typical fantasy hero role and begins the game in the uppermost section of an unmapped dungeon containing a wealth of monsters and items that along with the environments would be similarly generated for each game. The ultimate goal is to survive to the very bottom of the dungeon and retrieve the Amulet of Yendor (Rodney spelt backwards), and then fight his or her way all of the way back out again. Monsters would become more difficult the deeper a player delved into the game world and permanent death would see a complete restart on the part of the player for every character sacrificed in a whole newly generated world. 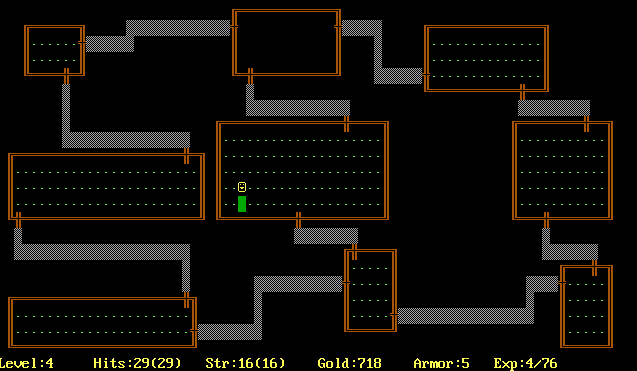 Visually, Rogue generates its environments using icons and letters from the keyboard to represent an overhead view of the map for each level of the dungeon. Because of this it can be confusing to look at for the first time. The @ symbol is used to denote the player’s location at all times and text outlines the level, current gold in your possession and base stats at all times. Finding the exit on each floor and avoiding/killing the monsters that inhabit it is a key element of play. The game itself works in a turn-based order, meaning that all monsters in a dungeon will take on action only after the player has taken theirs, allowing time for careful planning and strategizing. Graphically confusing until you understand the games kinks. Another game, Colossal Cave Adventure, was cited as a large inspiration for the original build of Rogue. This game was a text adventure designed by Will Crowther, an avid caving enthusiast who sent the players exploring in a fictionalised version of the Mammoth Cave in Kentucky. Dungeons and Dragons was again also a key influence, further marrying early video game RPGs with their pen and paper cousins. An early build of the title featured many monsters in the D&D rulebook, which were later removed and renamed for legal reasons. A commercial port of Rogue wouldn’t appear until 1988, however it was unofficially distributed from as early as 1980, with Dennis Ritchie (a notable computer scientist) once stating that Rogue “wasted more CPU time than anything in history.” The game was ported to the Amiga, Atari ST and the TRS-80 Color personal computer in addition to the Amstrad CPC, Commodore 64, Atari 8-bit and ZX Spectrum later. By this time clones of the original were beginning to appear as other began to mimic the concept of procedural generation, coining the term Roguelike. In 1987 NetHack was released based off of the game expansion Hack, which directly built on the foundations of Rogue to add new content. To this day NetHack continues to present us with a classic take on the genre as defined in the original game and millions of players log in to experience it daily. Other modern titles to borrow the base concept include the ‘Mystery Dungeon’ and ‘Diablo’ series. Later revisions included the use of colour. After laying down an example of what he was capable of with Alkabeth, Richard Garrett returned with this more impressive first instalment in a nine-part series (more if you count the Underworld and Online titles among others) that would define Western RPGs for quite some time. First published for the Apple II in the USA by the California Pacific Computer Company, it is considered to be the first true open-world computer game. Garriott began development on Ultima shortly after the unexpected success of Alkabeth, using large sections of his pervious title as subroutines within Ultima’s build. This can be seen most evidently in the first-person dungeon segments of the game. Towns, quests and a plot alongside a User Interface (UI) were all implemented new to the code for Ultima. Development of the game was done whilst Garriott was a freshman at the University of Texas with the help of his friend Ken W. Arnold, and the pair finished work within a year. In addition to using tile-based graphics for the first time, the finished game was also the first to come on more than one size of a floppy disc, an unprecedented size for a game at the time. Garriott initially gave his new game the title ‘Ultimatum’, however he was informed that the name was already copyright elsewhere and settled for shortening the title to ‘Ultima’ as an afterthought. The game went on to sell 50,000 copies in the states, cementing Ultima as a must-own title for many RPG fans. Unlike the games which had come before it, the real draw to Ultima was the plot. Before the release of Ultima most games had simply seen fit to allow a player to create and name a character before sending them off with a single quest denoted by a small amount of text to prompt the player. Games which sought to tell an interactive story were relegated to the text-only ‘Adventure’ games of the time, which essentially sought to replicate the ‘choose your own adventure’ style seen in books at the time such as ‘The Warlock of Firetop Mountain’. Ultima presents the player with a rich back story and a villain by the name of Mondain who must be defeated. He created an evil gem over 1000 years prior to the games start that grants him immortality and has flooded the world with monsters. Lord British (as seen in Alkabeth) searches for a hero and the player steps up to answer that call. Unlike previous games however the plot continues to be forwarded as the game progresses, and eventually cumulates with the player collecting parts to construct a time machine and defeating Mondain before he was immortal, thus rendering him killable. A supporting cast including Lord British, Iolo and Shamino would become staples of the series. Ultima was groundbreaking for the time and even included ships. Interestingly, having spilt onto a second disc Garrott decided to include a first person space shooter segment to the game, which switches up the genres for a brief while and breaks from the games usual systems. Garrott was dedicated to filling every inch of the space available to him and thought that players might like a change of pace later in the game. Whilst the magic and combat systems are simplistic by modern standards, spells can be purchased and used as consumable items and weapons/armour can be purchased to increase base stats. Levelling your character was essential, with a key item only available to the player once he or she had reached level 8. Ultima saw remakes on the Atari 8-bit, Commodore 64, MSX2, FM Towns and DOS before being updated to run on the Apple IIGS in 1994 by Origin Systems for Sierra. Ultima would quickly go on to produce Ultima II and III, pushing the idea of what an RPG could be even further than before abd rebranding Ultima as ‘Ultima I: The First Age of Darkness’, the initial instalment in the ‘Age of Darkness’ trilogy. ‘Ultima II: The Revenge of the Enchantress’ was released just a year later in 1982 and was recoded from the ground up in assembly language instead of BASIC. This gave the player a faster and smoother experience than previous titles. Garriott wanted to include a cloth map in the box with this second, larger title and California Pacific Computer was undergoing financial struggles at the time, which led to Sierra On-Line scooping his talents instead. Cloth maps of the world setting would be included with every subsequent Ultima title released. Ultima II sold over 50,000 copies in 1982 and has grossed over 100,000 copies to date, scooping up a nomination for ‘Best Adventure Game for Home Computer’ at the 1983 Origins Fair. The plot of the game sees the player learn that the enchantress Minax, lover of the evil wizard Mondain (who you slew in the original title) and intends to manipulate time doors created by your earlier time travelling escapades to disturb the very fabric of time. Lord British calls for helps and ‘The Stranger’ (the first name in cannon for the player character) steps up to the challenge. ‘Ultima III: Exodus’ came the year after in 1983, capping the initial trilogy. Featuring revolutionary graphics for its time it used animated characters on screen at all times. 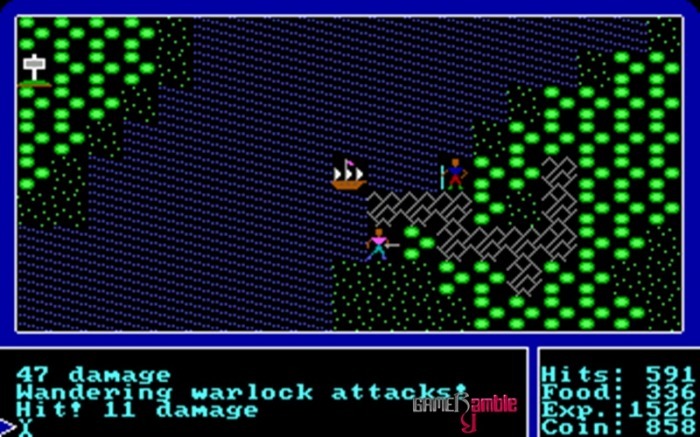 In addition to controlling ‘The Stranger’ an additional three characters make up a party of four, a first for the series (but beaten to being the first party based RPG by Wizardry in 1981) and combat takes on one of the earliest examples of a Tactical RPG system, with characters moving and attacking on a squared grid in turn. Dungeons were solid, rather than wire frame 3D in appearance and were more firmly installed into the games plot, which centres around the struggle against a doomsday machine called Exodus left behind by Mondain and Minax. Those players who completed the title were able to report their ‘victory’ to Origin, with those who did so receiving a certificate of completion signed by Garriott himself. Although Exodus features heavy inspiration from the Wizardry series, it is credited as the foundation for what would later be known at the RPG video game genre, going on to be sited as an influence for Japanese RPG franchise giants such as Dragon Warrior and Final Fantasy. Richard Garriott has always been quite modest about his effect on the genre, and frequently points instead to Wizardry and Dungeons and Dragons as large influences on his own life’s work. Over 120,000 copies of Ultima III were sold, making it the seventh best-selling game of all time in 1985 and was once of the first games inducted into the Computer Gaming World Hall of Fame. Developed by Andrew Greenburg and Robert Woodhead in 1980 and releasing in 1981, Wizardry: Proving Grounds of the Mad Overlord would become the first title in a series of 8 (at current count) mainline titles and over 26 spin-off games. It holds the honour of being the first game to include colour graphics, as well as the first video game to replicate the experience of having a party of characters rather than a solitary hero, as was commonly the case in its inspirational pen and paper games. 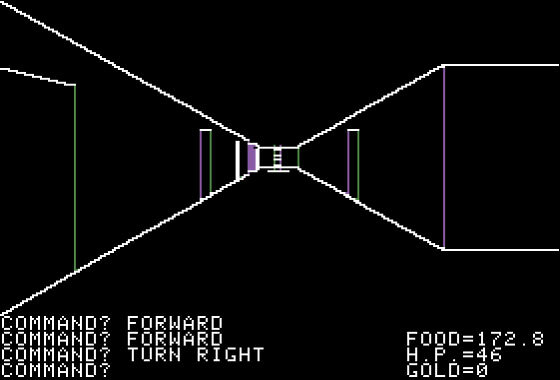 Drawing influence from earlier PLATO games, most notably a title called ‘Oubliette’, Wizardry was initially coded in Applesoft BASIC before being completely rewritten in UCSD Pascal after the game proved to run too slowly in its original format. This caused a year’s delay in publication after the game was shown off at the 1980 Boston Computer Convention in order for run-time systems to become readily available for people to play the game on. An effect not unlike having to upgrade ones desktop to meet the specifications of a newer and more demanding title today. The upside of this meant that Wizardry has a whole year in which it could be extensively play tested and balanced before seeing release in 1981 and so brought with it a level of polish that was missing from the comparatively ‘rougher’ titles on the market at the time, such as Ultima. The game was also produced in professional packaging with printed documentation rather than a home-created set. The game is essentially a dungeon crawl through the ruins beneath ‘Trebor’s catsle’. Beginning the game in a town, represented as a text based menu, the player is prompted to create a party of up to 6 characters from a range of races inspired by Tolkien’s fiction Middle Earth setting, choose an alignment between Good, Neutral and Evil (a simplified version of Dungeons and Dragons’ more layered alignment system) and the four staple classes of Fighter, Thief, Mage and Priest. These could later be upgraded in-game to elite class version of these basic versions, gaining elements of other classes skills to make them more powerful. Good and Evil characters can usually not be assigned to the same party, however players quickly found ‘exploits’ to allow this. From there the party is equipped with weapons and armour before descending into the dungeon below, consisting of 10 increasingly difficult levels. Monsters were rendered using solid colour for the first time. 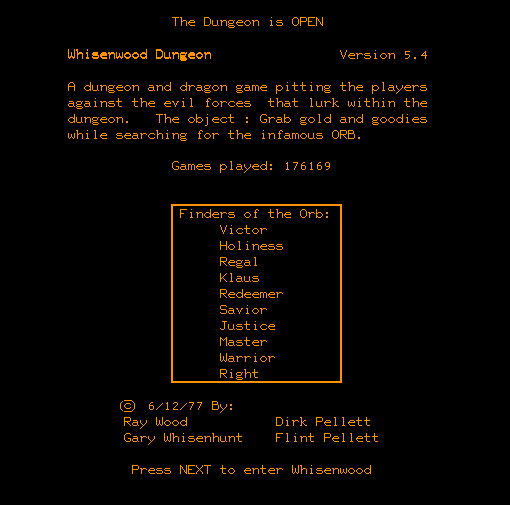 Whilst most of the screen is occupied by text at all times, showing the six characters by name, class and stats for quick-reference, a small portion of the screen was devoted to displaying a first person view of the dungeon. When combat is initiated the dungeon display vanishes and is replaced by groups of up to four monsters. Even for the time, Wizardry was punishingly difficult to play and featured extremely hard dungeon floors and monster encounters. Players were encouraged to draw maps of the maze-like environments to prevent themselves from getting lost and traps were included to teleport the player abruptly or spin them around. Progress (the current party, their experience and equipped items) can be saved to a blank floppy disc, though only when outside of the dungeon and in the event of a party being wiped out play cannot be resumed, although a new party of adventurers can recover the bodies and regain their items. Interestingly completion of this title is necessary to play the sequels (Wizardry II and III) as they require that the characters from the first game are imported from a saved ‘scenario’ disc. Wizardry was an almost immediate hit on launch and the most popular game on the Apple II in 1981, outselling Ultima by 24,000 copies to 20,000. The game has the honour of having the first published strategy guide ‘The Wizisystem’ produced in order to make solving the games deliberately difficult dungeons easier for average gamers not up to the challenge, and a child psychiatrist at the time reported using the game successfully as therapy. Wizardry was voted the best Adventure Game for 5 years by the general public in Computer Gaming World’s annual poll until the release of Ultima IV finally replaced it in 1986 and it saw ports to the Apple II+ and MS-DOS among other contemporary systems. The DOS port was well regarded. ‘Wizardry II: The Knight of Diamonds’ was published in 1982 by Sir-Tech Software Inc and served to move the action from the dungeon beneath Trebor’s castle to the city of Llygamyn, which was under siege. The only hope for salvation lying in obtaining the Staff of Gnilda and trading it to the mystic Knight of Diamonds to repel the invaders. Functionally it was identical to the original title and lacked the longer development and testing cycle that had benefitted the first game so much. Each level of the dungeon contained a piece of the titular knight’s armour which needed to be assembled, encouraging more exploration, but the reduction from 10 to just 6 levels and the need to import cleared data from the original game to play it soured the experience somewhat for the gaming public. Despite this however the game was labelled ‘Best Adventure Game for Home Computer’ at the 1983 Origins game Fair, defeating Ultima II and other nominees. It also received a Certificate of Merit in the category of ‘Best Computer Adventure’ at the 5th annual Arkie Awards in 1984. ‘Wizardry III: Legacy of Llygamyn’ (sometimes referred to as ‘the third scenario’) was published in 1983 and again took place in the city of Llygamyn, which is this time rocked by earthquakes as a nearby volcano threatens to erupt. Seeking out the aid of the dragon L’Kbreth is the only means by which to save the city and amounts to another 6 level dungeon crawl through a vertical scenario rather than the traditional ‘descent’ method of the genre. Whilst alignment was given special precedence in this edition, with some types of character only allowed into certain areas of the map (troublesome for those working around the ‘good or evil’ rule), forcing many players to create and level additional party members to explore some level of the dungeon. Functionally however the game continued to retain the original build and systems, serving only to expand upon the adventures of your party. Though not as acclaimed as its predecessors the game sold extremely well, capitalising on the large install base of Wizardry I and II at the time. In a modern environment the model applied to the original Wizardry series can be seen today in the additional DLC or ‘Expansion Packs’ provided for games such as Mass Effect and Dragon Age, or in the quick-release sequels such as ‘Tales of Xillia 2’ which act not as mainline titles but as additional releases to curb fan enthusiasm while working on the next big product. Sometimes known as ‘Tales of the Unknown: Volume I’ but better known by its subtitle ‘The bard’s Tale’, this fantasy RPG was created by Michael Cranford and distributed by Electronic Arts in 1985 on the Apple II (although it was quickly ported to the Commodore 64, DOS, Macintosh, ZX Spectrum and Amiga among other systems). It featured unprecedented 3D graphics at the time of its original distribution and used partially animated character portraits to give a greater sense of a living world. The Bard himself was something of an innovation at the time, a character type that had been seen before but never placed at the centre of a story, able to cast spells using a series of six different tunes. Michael Cranford was a devout Christian and included numerous references to Christian beliefs throughout the games world. All but one of the cities the player will explore are named after elements of the New Testament and Jesus is regularly mentioned in conversations. Although Cranford is singularly credited for the game, alongside Lawrence Holland who composed the music and its interface and artist Eris Joyner who produced the cover art, Rebecca Heineman (who would later write the code for The Bard’s Tale III) claims to have personally written much of the games code, and references graphic, animation and sound routines as well as creating the in-house tools used to build the game and art assets. Cranford, while acknowledging her “coding genius”, states that he believes her role in development of the original and its first sequel was “Minimal”. Friction between the pair over the course of development is a matter of record however, and upon completion of the game Cranford took sole custody on the master version and refused to give it to EA until a contract was signed allowing the sequel to be worked on by him exclusively. An act that would see him leave the series by the third title and Heineman given the leading role, ditching everything that had come before and starting from scratch. A whole song was written to introduce the player. With so much drama behind the scenes one would imagine that the game would be a complete mess, but the reality was far different. The Bard’s Tale played well and was extremely successful, becoming the first non-Wizardry title to threaten the Ultima series’ monopoly of the genre. The game is a dungeon crawl across a wide range of locations that sees players form a party of six characters in the Adventurer’s Guild (the only location in the game where the current party and their inventory can be saved). Progression is made through levelling and purchasing better equipment so that they are capable of defeating more advanced foes, allowing them to delve deeper into dungeons to reclaim key items that are relevant to the overall quest. The game itself tasks you with exploring a location called Skara Brae, a walled town with various points of interest in which the party are stuck due to a snow storm raging outside. The most important character in the game is evidently the titular Bard, whose magic is woven through songs and have a long lasting effect on the rest of the party in various ways (such as boosting their defensive or offensive capability). As the Bard does these actions the corresponding music will be played for the player. This technique would be applied in later games and referred to as ‘buffing’ the party. The Final Fantasy series contains a number of buff spells and occasionally represents these through a number of classes, including the Bard, whilst whole classes are built around the concept in modern MMORPGS. Several puzzles in the game are unsolvable without the Bard playing the corresponding music, and the mixture of classical and originally written pieces works in the games favour. Exploration from a first person viewpoint was kept throughout the title, with the screen split in a similar fashion to the Wizardry series and turn based combat which is described in text rather than shown graphically. Surprisingly, saved parties from both Wizardry and Ultima III could be imported into the Bard’s Tale and used. This was a revolutionary feature at the time, allowing players to get a little more action out of the floppy disc they’d saved and set aside, but was frowned upon overall by the game development community as an opportunistic way to draw in players of the competitor’s titles. Saved data from the Bard’s Tale would be carried across all titles in the series, allowing the player to mature their party. 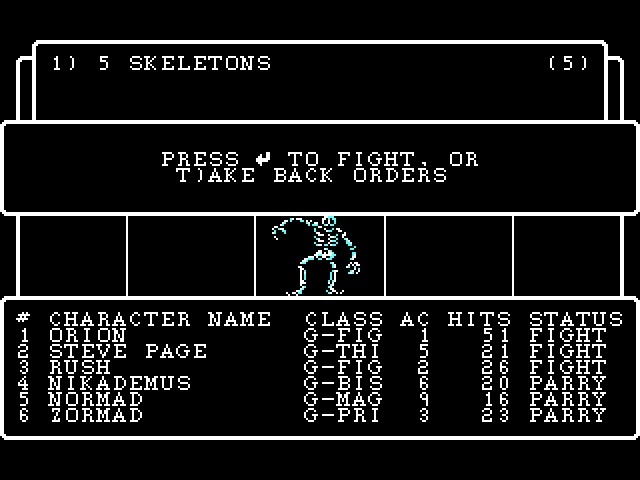 The game also featured copy protection of a sort by including 85 spells which were typed into the game from the manual in order to be cast, ensuring that less pirate copies (which came without manuals) were distributed. The later DOS, Amiga and Macintosh versions of the game would drop this feature in favour of implementing a mouse-driven interface with a list to choose from. Not too dissimilar from Wizardry, but many more colourful ports followed. There are two official sequels to the Bard’s Tale, the first of which was completed by Michael Cranford in 1986, whilst the second was made by Rebecca Heineman under the guise of “Burger” Bill Heineman with Cruce Schlickbernd and Michael A. Stackpole. A Construction Set was also released based upon Heineman’s world creation tools that allowed players to play Game Master and create their own dungeons for the first time. ‘The Bard’s Tale II: The Destiny Knight’ was received with mixed reviews, having built little upon the original (adding only a casino and bank to the mix) although it did go on to win the Origins Award for ‘Best Fantasy or Science Fiction Computer Game’ in 1986. Combat also added ranged weaponry and enemies, and dungeons occasionally featured time limits on puzzles. It was overall a much larger game than the original, spreading across multiple cities than had only been briefly mentioned in the original. ‘The Bard’s Tale III: Thief of Fate’ was the second sequel and a considerable improvement over the originals, with a graphical auto-mapping feature that covered all 84 dungeon levels featured in the game, a first for any game and life-saver for those used to having to draw their own on graph paper. 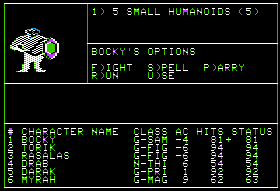 It also included an enhanced saving feature and two new spell casting classes in the Geomancer and Chronomancer. Missions involved a wider variety of puzzles to solve, taking influence from Adventure games such as ’Zork’ and allowing the player to use items to solve obstacles. The story (which ignores the second games narrative entirely), based around the concept of the player party receiving a letter from a dying man who informs them that the Mad God Tarjan has unleashed creatures onto the town of Skara Brae and tasks the party with a dimension-hopping adventure to slay the a god, who is assassinating other deities in the heavens. This gives an excuse to visit an extremely broad series of locations and explore them. Plans for a fourth game were drafted and scrapped, and with the exception of the Construction Set, the series would remain on hiatus until 2004 when a Playstation 2 title simply named ‘The Bard’s Tale’ would attempt to relaunch the series. Although ultimately unsuccessful, the game featured high production values and saw its way onto iOS and Android platforms after being optimised for touch screens. Not a bad game by any means, it failed to capture the spirit of the originals and instead attempted to create a satirical look at the WRPG genre. The formulative years of the gaming industry clearly show the influence of pen and paper RPGs, with many being created by avid Dungeons and Dragons players or citing it as an inspiration. At the outset games took two very different paths before beginning to combine into something more recognisable as the RPG we know today. Those that sought to develop a deep story and rich setting edged toward the route of the interactive novel or ‘Text Adventure’, such as ‘Zork’ or ‘Adventure’. Conversely, other games concentrated on replicating the combat and dice rolling elements of those same games and left plot development by the wayside, creating titles such as ‘Rogue’. It wasn’t until Ultima began to bring those two elements together as a unified whole that the RPG genre was effectively born, although as the series grew it took reference of the titles being released around it to better advance itself. The face of RPGs in this period is defined by Wizardry and Ultima, each competing to outdo the other with titles from other publishers and designers seeking to emulate or outdo them at their own game. It’s worth noting that in the centre of this timeline the Video Game Crash of 1983 brought many companies to a standstill and caused many to believe that video gaming in any format were a fad that had run its course. Known as Atari Shock in Japan, the event brought a sharp conclusion to the second console generation and heavily impacted computer sales. Caused by a flood of badly made ports and rushed unplayable games across too many platforms that over saturated the market and brought the overall quality down. RPGs however seem to have been relatively shielded from these events, with Wizardry and Ultima both releasing their third instalments directly at its centre and titles such as ‘The Black Onyx’ and ‘Telengard’ carving a name for themselves. Over the course of a relatively short period we’ve seen games evolve to include colour graphics, visually represent events on screen with moving sprites, parties jump from one to up to six characters and wire-frame art replaced with solid illustrations. Many of the elements we associate with the genre are now already in place, such as character creation, levelling characters, buying and selling equipment, turn based combat and procedurally generated dungeon layouts. Games have also evolved from something created by students on university mainframes to home-brewed and then studio produced in a very short time, now packaged in real boxes with maps and intricate trinkets. Most of the titles in this period were produced in the west, but in our next instalment we will begin to see the expanding legacy RPGs had when they impacted on Eastern shores.